The Edmonton Oilers welcomed Connor McDavid back to the fold on Tuesday night, as expected, and he made an immediate impact. The 19-year-old from Richmond Hill showcased his speed and skill, lining it all up for a scintillating goal in the second period that may well be the finest anyone’s scored all year. He finished the game with three points, two of which came in the middle frame of Edmonton’s 5-1 victory over the Columbus Blue Jackets. 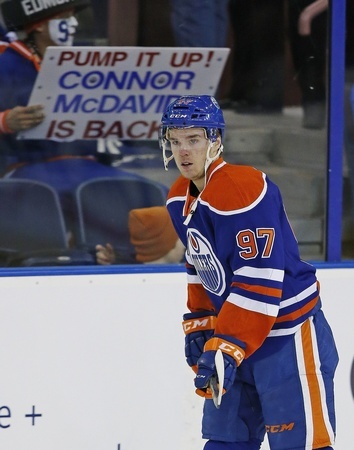 McDavid’s return lived up to the billing and gave the Oilers a much-needed boost. They lead the NHL in games lost to injury, with key contributors like Oscar Klefbom and Ryan Nugent-Hopkins missing considerable time. Jordan Eberle started the year on the IR, too. And McDavid, out for 37 games, was possibly the most detrimental of the losses for the Oilers. Just 13 games into his career, he’d already proven himself as an effective and dangerous hockey player. He leads the team in scoring efficiency on the power play and at even strength and those numbers should only increase from there. Consider that McDavid, prior to Tuesday’s game, averaged five points an hour on the five-on-four power play. Tyler Seguin is working at the same numbers and only 31 players in all of hockey have reached the same level. The return of McDavid clearly gave the Oilers a leg up against Columbus, handing the Blue Jackets their first loss in three games on top of it all. And his return will translate to further benefits. Coach Todd McLellan now has the ability to roll more than one offensive line, too, with the Taylor Hall/Leon Draisaitl/Teddy Purcell unit getting some much-needed support. There are other factors to examine, like how McDavid controls the run of play or how he can maintain the action on the right side of the ice, and everything adds up to an unbelievable presence. For now, the return should be celebrated. McDavid didn’t miss a beat in his return and his explosiveness is out of this world. It’s easy to be a cynic in this game of hockey, but this persistent thriller has the ability to excite and enthral. And on Tuesday night with 16:43 of ice time, he gave the Oilers and their long-suffering fans a reason to stand up and cheer.